ScarKit Options: Required Choose Options Super CP Serum and TCA 13% 1oz. Super Cop 2x and TCA 13% 1oz. Super CP Serum and TCA 20% 1oz. Super Cop 2x and TCA 20% 1oz. Super Cop 2x and TCA 30% CROSS 1oz. Super CP Serum and TCA 30% CROSS 1oz. Included (Exports choose Healing Oil): Required Choose Options 1oz Gly Serum 15, Emu 2oz 1oz Gly Serum 15, Healing Oil 1oz. *The EMU oil in this Kit is currently not available for exporting. Please choose Hyaluronic as your healing treatment. Everything you need to minimize, or even remove, scars in one professional kit. Once your wound has closed, the process of skin remodeling will take place. This is the perfect time to start using copper peptides. If you are working on a scar that has already formed, is months or even years old, then you will want to start breaking down the scar tissues with a daily acid application and a peel every few weeks. Follow this breaking down phase with a rebuilding phase by using the copper and emu oil. Pure Emu Oil 2oz. (alt Essentials Healing Oil 99% Organic blend): Healing, anti-bacterial ointment and moisturizer. Super CP Serum 1oz. (Serum or SuperCop 2x Cream). Regenerating, flush out scar tissues and damaged fibers. Gauze pads and a Dropper (a few to get you started!) If you have pitted scaring, we suggest doing the TCA CROSS method, of which you will also need the Cotton Tipped Wooden Picks. 1X every 2-3 weeks apply peel solution to scarred area and then put on Copper serum and Emu oil. In the morning, apply the Glycolic Serum 15% and 1-2 drops of Emu oil or Healing Oil to the acne scar. You can apply more Glycolic Serum during the day. But reduce the amount if your skin becomes irritated from the acid. In the evening, use Copper Serum and Emu oil or Healing Oil on the scar. The key is to keep working on the scar. With continued use you will experience new collagen and elastin growth, reduction in fine lines, acne, scaring and sun damage. Please feel free to call us with any questions regarding choice of acids. (m-f 10:00a.m. - 5:00p.m.) 586-598-6093. *California residents: This product contains TCA. You may still purchase this product by agreeing to our Shipping Policy during the checkout phase. The secret of hydroxy acid actions is that your healthy, normal skin is very tough and has a high resistance to such acids. 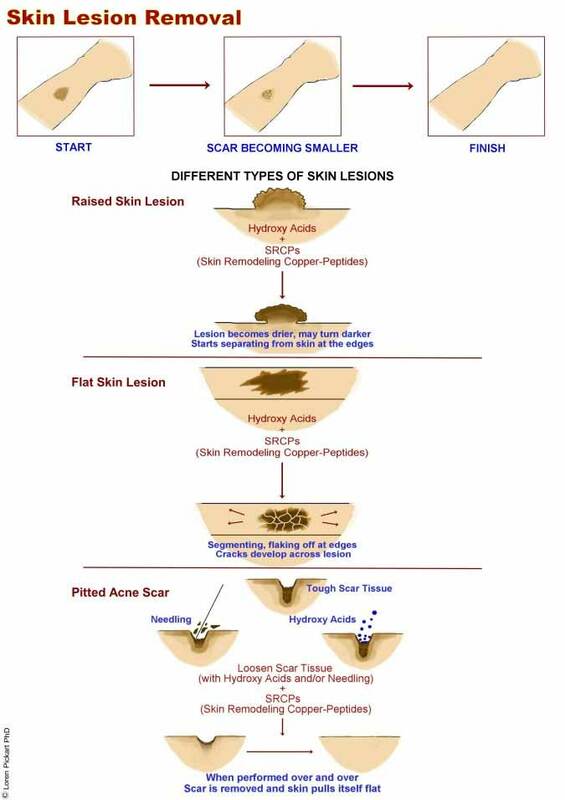 In contrast, most skin lesions have less structural integrity and are more easily broken down by the acids. The repeated use of such acids over periods of a month or longer slowly dissolves most skin lesions. The use of strong copper peptides after the acids creates a skin environment that helps the regeneration of the normal, healthy skin. So, by repeated daily application of a hydroxy acid, you can slowly dissolve away the skin blemish and use copper peptides to aid the rebuilding of your healthy, smooth skin. This process is repeated once daily or twice daily and an improvement should be noted in a month but obtaining a cosmetically satisfying result may take several months. *In order to speed the process along, this Scar Kit also contains a TCA peel solution to apply directly to the scar. We suggest adding a few drops of emu oil to the Copper Serum and the Glycolic Serum 15% to help the products reach deeper into your skin. We highly suggest performing the TCA CROSS method if you are dealing with pitted scarring. This is where a sharp wooden pick is soaked in a TCA solution (usually a 20% or 30%) and is applied with slight pressure, directly into the center of the indentation. After performing a CROSS method though, a 5 week waiting period must be observed before performing another peel on that area. After the scab has fallen off, wait another few days for skin to return to normal, then you may move forward with the daily glycolic and copper application methods. Daily treatments: rub the 15% Glycolic Serum into the pitted scar, every morning, on a daily basis. This slowly dissolves and removes the scar tissue. In the evening use the copper peptide serum. This helps stimulate a slow rebuilding of your skin. As the scar tissue is replaced with healthy skin, the skin's surface pulls itself flat like a balloon. Most people use the hydroxy acid at one time of the day, such as in the morning and the copper peptide later in the evening. With continued use you will experience new collagen and elastin growth, reduction in fine lines, acne, scaring and sun damage.To learn more about individual products contained in this kit, click on item below and go to the product page for full information.